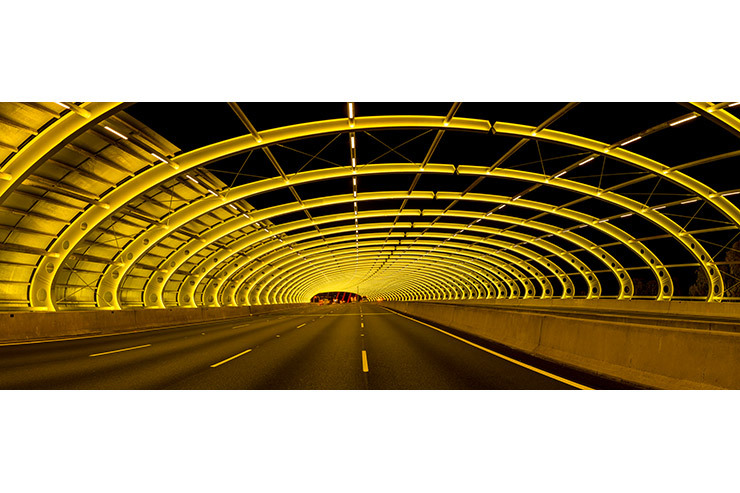 The CityLink Sound Tube was designed by Denton Corker Marshall 20 years ago and has become an iconic Melbourne landmark. 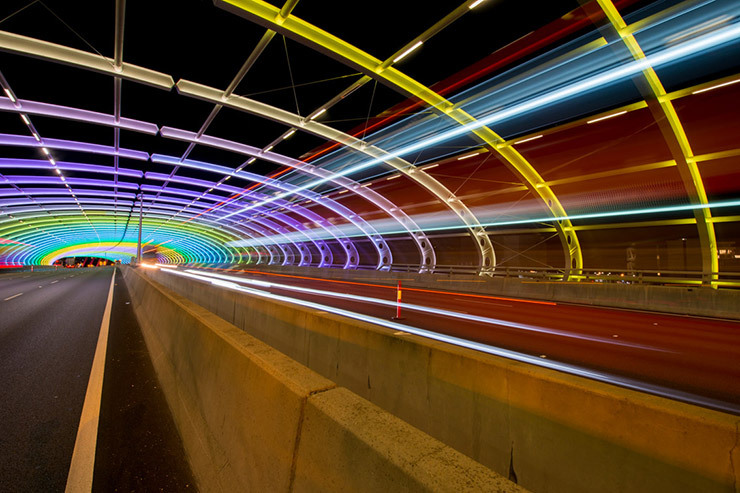 Electrolight was contracted by Transurban as part of Transurban’s community engagement activities. The designers were asked to look at ways to enhance and compliment the architecture of the Sound Tube structure using light. One important criterion was that the lighting needed to have the ability to be colour selectable to provide an element of dynamism and allow it to create a connection with local and international events. 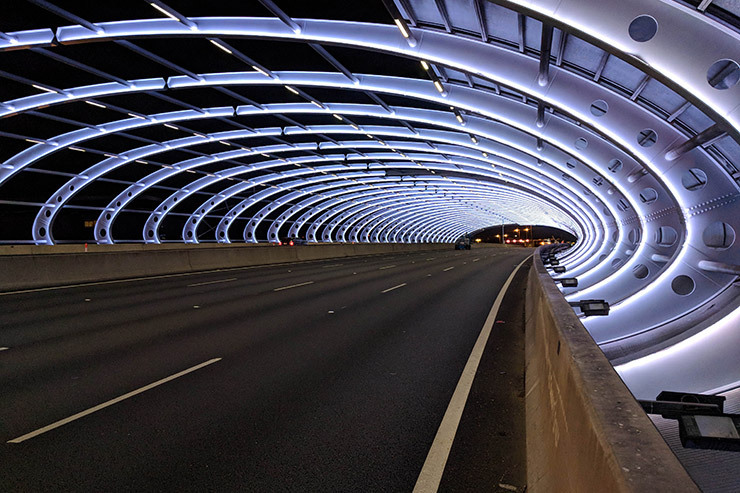 As part of our design process, we explored lighting opportunities such as upgrading the existing lighting scheme, as well as new possibilities to enhance and articulate the unique architectural elements of the Sound Tube design using the latest in lighting technology. Electrolight’s design vision was for a lighting scheme that would transform the Sound Tube at night by highlighting its architectural features though the use of concealed light fittings that enhanced the repetitive structural language of the architecture, washing light up the vertical face of the girder beams from both sides. The highly controllable LED colour selectable (RGBW) units can be controlled to provide infinite selection of colours and combinations, allowing for themed content throughout the year. 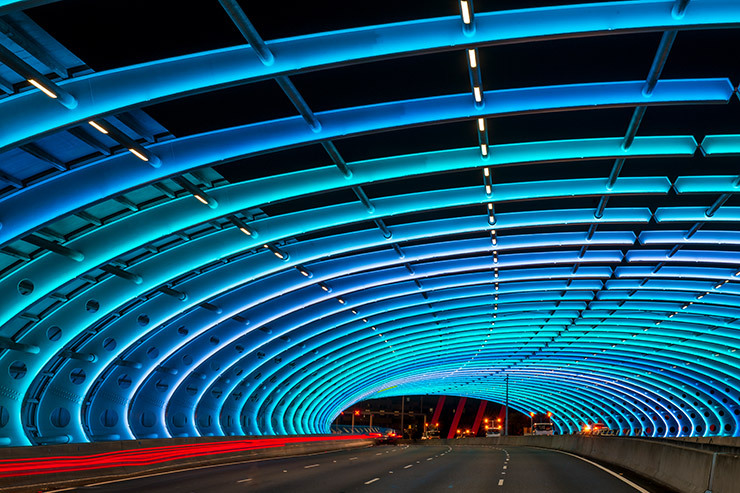 The Sound Tube doubles as a clever branding device, celebrating major Melbourne events through light and colour; it’s also a welcome portal, building wonder and excitement as you pass through the tunnel and out into the city beyond. When it came to specifying a luminaire, Electrolight selected a fitting that was minimal in aperture and provided the essential technical requirements of being colour selectable. And, importantly, it needed to withstand the harsh environmental conditions of the freeway. Despite the challenge of tight time constraints, Sound Tube was developed and completed in optimum time, with a focus on efficient project management and smooth coordination across all parties. 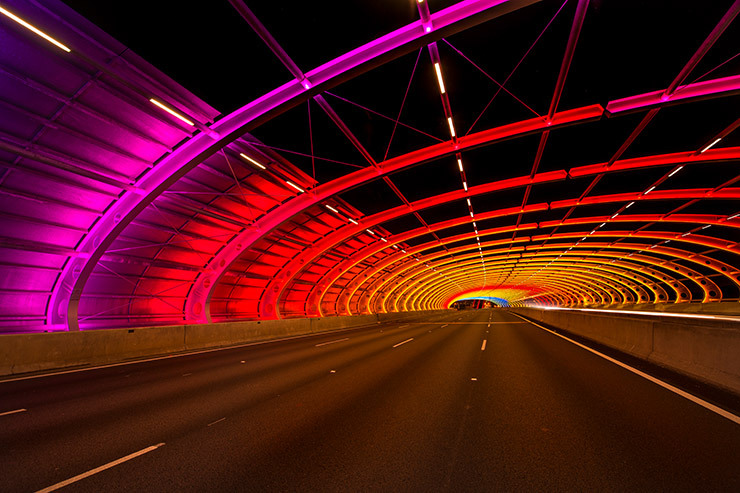 The CityLink-Tullamarine corridor is one of Melbourne’s most heavily used roads, carrying about 210,000 vehicles a day in its busiest section. 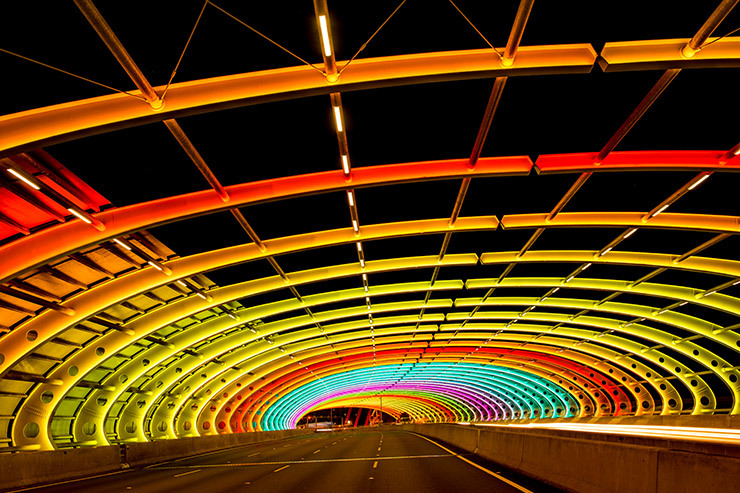 The Sound Tube joins other iconic pieces of local infrastructure in lighting up Melbourne.